With Spring now in full sway down on my allotment plot, the Circus Garden, I had (quite literally) a growing number of ingredients from which to choose when creating this recipe to mark National Vegetarian Week. What started as a mere trickle of plants just a few weeks ago – the initial, tentative shoots of asparagus, the first stirrings into life of mint, chives and other herbs – has started to gather momentum as broad beans, lettuce, radishes, peas, spring onions, raspberries, basil, coriander and strawberries all start to come into their own. The mild Spring has encouraged sound and steady growth, and all of my vegetables, fruit, herbs and bee-friendly flowers are emerging looking healthy and strong. All of them, of course, are being grown organically. Indeed, it was because I insisted on growing my crops organically and refused to use glyphosate on the weeds covering my plot when I first started that I was called a “Circus Gardener” by a disdainful neighbouring allotment keeper. It was his way of making clear to me and others that he didn’t think I knew what I was doing and he didn’t care much for my organic techniques. So what is “organic” growing? Quote simply it is a chemical-free approach to cultivation, which relies on feeding and enriching the soil with natural compost. This naturally healthy soil in turn nurtures strong, healthy crops. Compare this with non-organic, modern agribusinesses which rely heavily on the use of chemicals – in the form of pesticides, fungicides, herbicides and manufactured fertilisers – to boost crop yields at the expense of soil health. In stark contrast to the organic approach, here soil is used as little more than a means to tether plants to the ground and to act as a conduit through which those plants ingest artificial fertilisers. The herbicides, pesticides and chemical fertilisers used in this method of farming work their way into, and eventually destroy, the soil. They also, of course, work their way into the food that is grown in that soil and, eventually, into the people and animals who eat that food. Beneath those layers of artificial chemical stimulants, the soil in which these crops are grown is slowly dying. The chemicals poured into it are acting as little more than a life support system to a critical patient. Intensive farming is leading to a loss of arable land at an alarming and increasing rate. An average of 23 hectares of soil is lost to desertification on this precious and finite planet every single minute, and modern agriculture practices are a major contributor. The organic philosophy could not be more simple: work with nature, not against it. Only organic soil management techniques guarantee the future of our growing soil, and thus our own futures. This week’s recipe is for a hearty, vegan organic soup. Vegan soup can be every bit as powerful and satisfying as any other, as the beautifully balanced flavours in this recipe show. 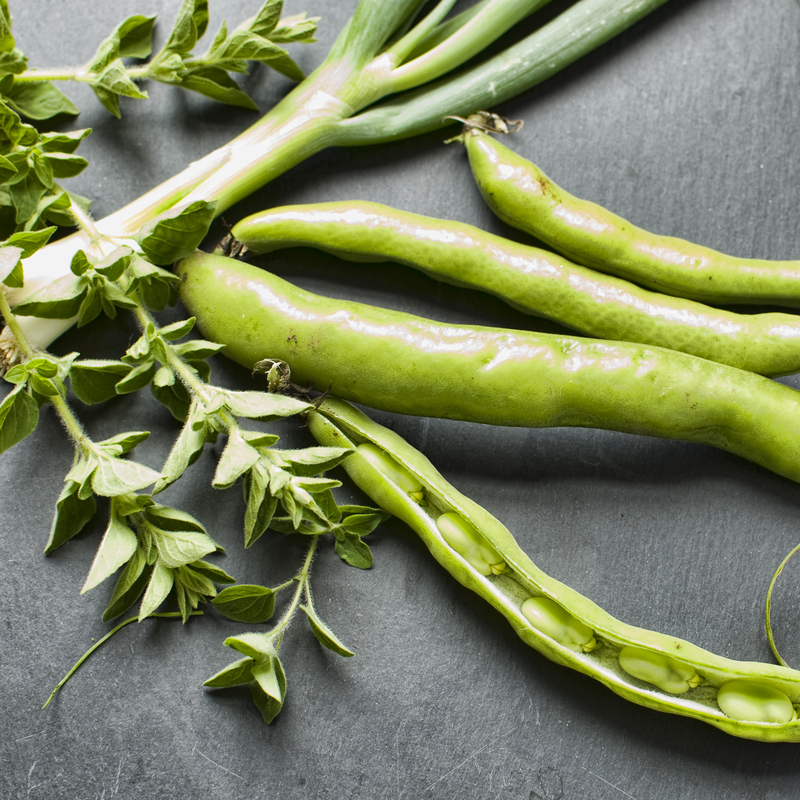 The broad beans lend the soup body as well as their distinctive flavour, which is complemented perfectly by sweet and tender new season spring onions and the punchiness of fresh oregano. 1. Bring a pan of water to the boil. Add the broad beans and cook for just two minutes. Drain and then immediately plunge the beans into a bowl of ice cold water. Next, you need to slip the bright emerald broad beans out of their skins. They should come out quite easily but if you have any willing hands around you, this is the point at which to put them to good use. 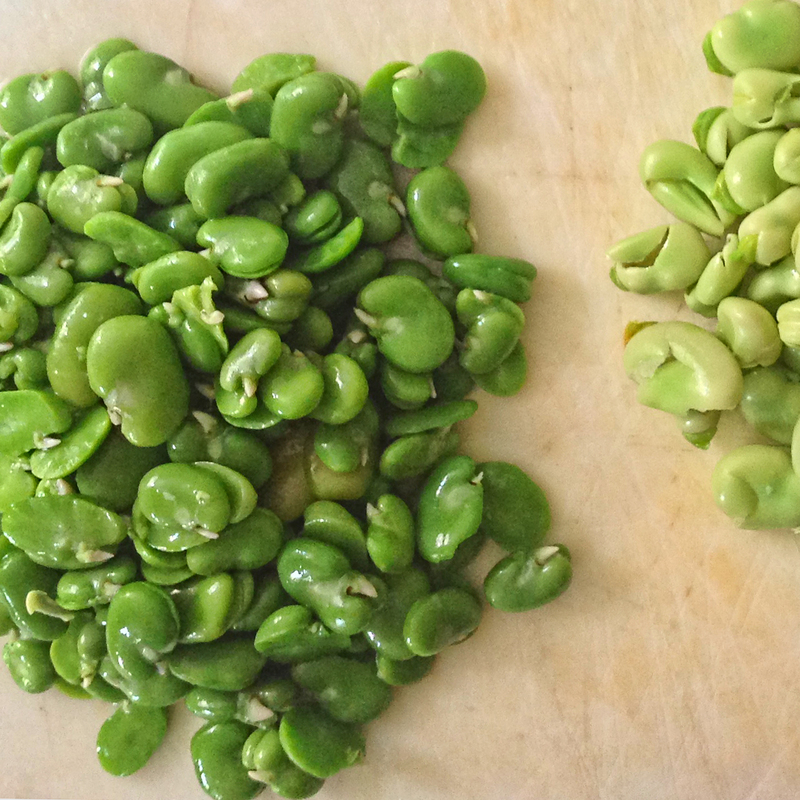 When completed, put the skinned broad beans to one side. 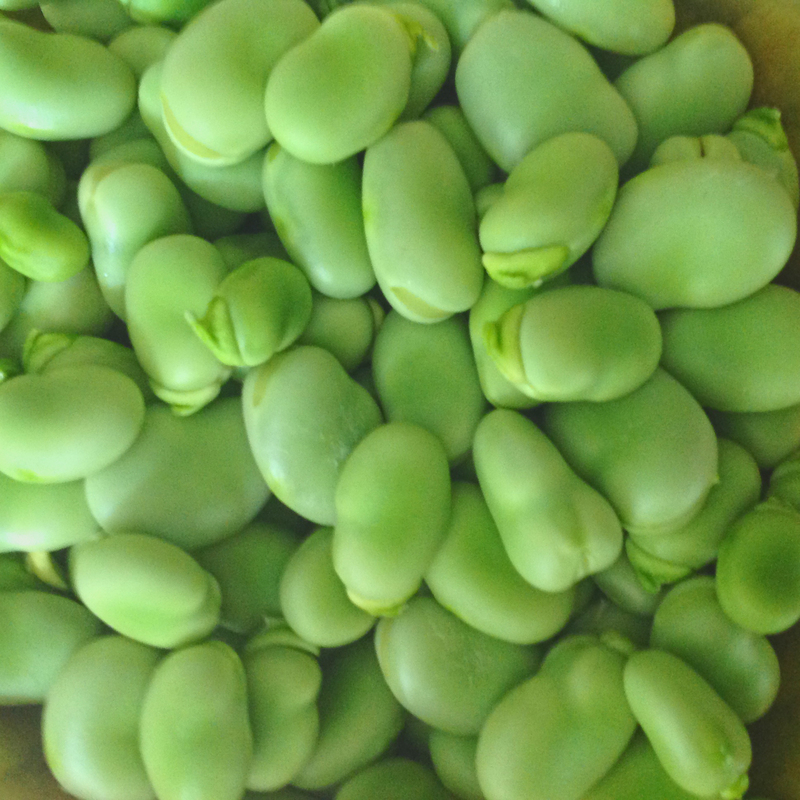 The skins from the broad beans can go into your compost waste. 2. Heat the olive oil in a pan over a medium heat. Add the onion and sauté for five minutes, stirring every so often, until the onion is soft and translucent. Add the spring onions, the broad beans and the peas, and stir. Cook for a further one minute before adding the stock and the sea salt. Bring to a simmer and reduce the heat to low. Simmer for a further 15 minutes. Add the chopped oregano and the lemon juice, stir and remove from the heat and leave to cool slightly. 3. Process the soup in a blender or food processor until smooth. Reheat gently in a pan. Serve in warmed bowls with good quality bread. 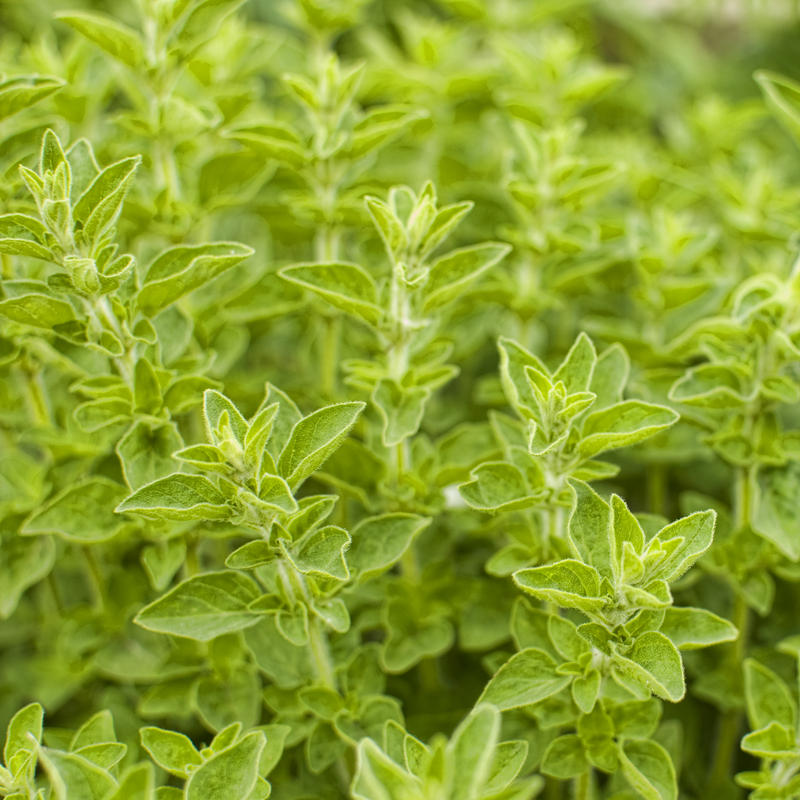 If you like, you could garnish with a little chopped fresh oregano and a few drops of extra virgin olive oil. Your broad beans and strawberries are way ahead of ours, making me excited at the thought of all those summery crops though seeing your beautiful pictures of those pods. Totally agree about working with nature rather than against it – and looking at your wonderful organic produce, it seems crazy not to grow this way. The soup looks delicious. And I remember some of the allotment old-boys standing staring cross-armed with disapproval at me when we had an allotment – think I must be a Circus gardener too! My broad beans are a wonderful early variety that I have grown for years now, called superaquadulce. I plant them in the Autumn and they produce ripe pods in mid Spring, usually well before the blackfly arrive. I grow several strawberry varieties but my favourite is Mara des Bois, which I brought in to overwinter in the greenhouse, only recently planting them back out again. Thanks to the mild weather they are already producing lots of strawberries. I’m truly delighted to hear you are a fellow “Circus Gardener”! Circus Gardener sounds quite polite really… it could have been so much worse. Isn’t it odd the way that intensive, chemical driven agriculture is now what’s called ‘conventional farming’, when organic used to be the norm. Your soup looks like the perfect way to finish a long morning of weeding in the veg patch. Hi Sarah, and thanks very much for your comments. This soup would be perfect after a good weeding session. Weeding is a major preoccupation on my plot right now – such a shame that the weeds seem to grow so much faster and easier than everything else! Lovely looking soup! But puzzled at to what your allotment neighbour even meant by “Circus” gardener. Why ‘Circus’ and what has that got to do with not using chemicals? Thank you! I’ve always assumed that in calling me a “Circus Gardener” he meant that he thought I was a bit of a clown, but who knows? It’s stuck with me now! Your soup looks and sounds delicious. I am growing broad beans for the first time on our plot but they seem to have stalled and are not much more than seedlings. I think next year I must follow your example and start some off in the autumn. We are trying to be a chemical free plot too! Thank you Ann. The soup really is delicious, and not difficult to make. I think you’ll find your broad beans will soon catch up as the weather gets warmer. Although chemical free growing can sometimes (but not always) mean a lower yield or the occasional plant lost to pests, on the plus side you at least know you can eat what you’ve grown without worrying!